Katie from Other People's Food with her Le Kit Cat Mousse . Congratulations Katie! By winning Katie will receive this book by Trish Deseine and she will be hosting the next round of HHDD, so keep checking her blog! 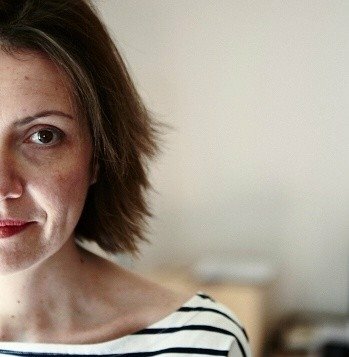 It was a great pleasure to host this round and ya'll made my blog look moussy good. Thanks again for the pleasure of having me as host! 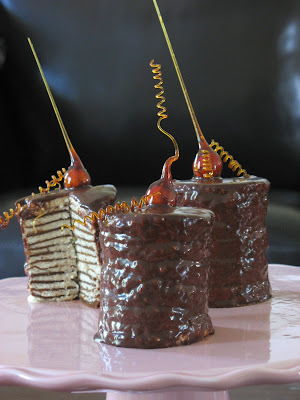 These three chocolate crepe cakes were actually part of a bigger group of 10, and shamelessly served to my dinner guests so I could complete my April Daring Baker challenge and tell you all about it. Remember the croissants or red velvet cakes? Yep, it is that time of the month again and our group grew even bigger this time so if you see 29 other Chocolate Crepe Cakes in various sizes and flavors, do not reset your computer. 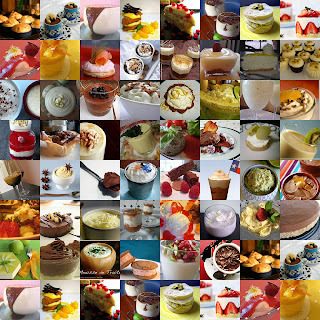 We decided to go big, go high…except with my never ending love of individual desserts I went small but high. 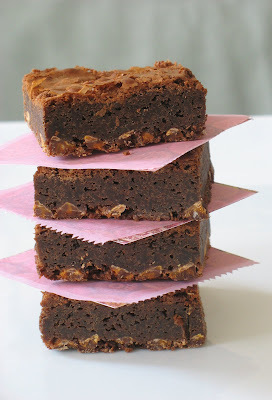 But fear not, from all our discussions it appears that all of us have had very different experiences with the same recipe, so I urge you to read all the other Daring Bakers’ posts to have a idea and in some cases a good laugh. Don’t get me wrong, the guests were delighted with the presentation, all those caramel dipped hazelnuts and mini caramel corkscrews. Yes, I could have gone another road and make it exactly asand I love crepes. For crying out loud, I come from the country of crepes, I make them every February for the Chandeleur, I even once made over 100 for our Girl Scout troups meeting! Yet, I hated these! I had no major trouble making the crepes, except that the batter was thicker than what I like to work with and the chocolate flavor did not really come through despite the 70% Lindt chocolate that I used. I like crepes on the lighter side, the ones I can swirl easily in a hot sauté pan with a slight and graceful wrist movement (or so I like to think! ); the ones that have tiny microscopic holes in them once cooled thanks to a little added beer to bring some air into them. In my case, Martha’s crepes were on the heavy side, kind of gummy, took longer to cook and required much patience while being flipped and handled. I ended up with about 30 crepes. To make the mini cakes, I took out 3 inch metal rings, cut out rounds in the crepes and began alternating filling and crepes until I had used all the crepes. The icing was the part that I liked the least. It was a thin ganache, which made it easy to spoon on top of the cakes but it slid down the sides way too fast to cover them nicely. 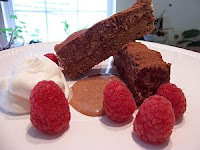 Looking at Martha’s picture I understand that it was to show the essence of the cake, kind of like “rustic ingredient (crepe) goes to the ball (caramel work)”, but that did not do it for me…I like smooth when it comes to chocolate icing…. Now the filling was another story! “Awesome” pretty much describes it. When Brilynn chose the recipe (Martha Stewart’s) this month, she was kind enough to let us play with the original and some of us decided t go another route. I originally made a blood orange cream, inspired by a lemon one from Pierre Herme , but it was so good we ended up spooning it on toasts, brioches, scones, anything but the crepes…shame on us, but that cream is so good it deserves its own post, so I went for the filling given in the recipe but made my own hazelnut paste (see end of post) because unlike Martha I did not find any “hazelnut cream” anywhere…that was too vague for my taste. I could eat this filling simply with a spoon and it would be fantastic in a macaron or sandwiched in 2 thin shortbread cookies. The final component of the cake was the caramel….and this is when I usually do a happy dance. I absolutely love working with caramel, but was not always the case but I had a great teacher in Old Chef and I am continuously learning from him. He is the same one who made me handle boiling hot sugar with my bare hands (burning them) almost 8 years ago so I “would get used to it”…(crazy old French man!) and yet I love him and love working with him. I disgress... To me caramel is as confusing, fun, tantrum-prone, and alive as yeast. There is always room for improvement and always thousands of way to handle it. At home, I use all kinds of weird contraptions to play with hot sugar. I duct tape 2 wooden spoon to my countertop above the dishwasher, open the door and spun my sugar in between the spoons. Once I am done, close the dishwasher door and turn it on…and voila…clean up done. 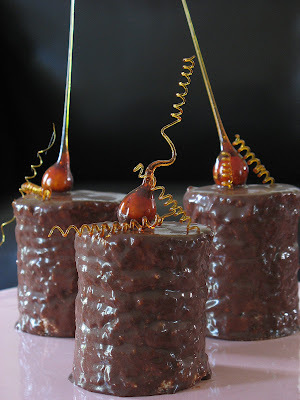 I thought about doing it nice little nest of spun sugar but I had already done that for the Chocolate Intensity challenge and I feared the mini cakes would get drowned under them, so I kept it pretty simple and clean. (Very Martha said B.) For the caramel hazelnuts I attached them to long skewers dipped them into the caramel, stuck the skewers into an apple and balanced the apple above the dishwasher. 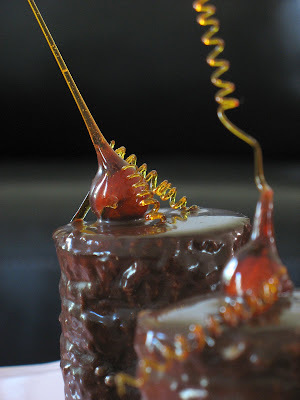 For the corkscrews, I lightly oiled a metal skewer and twirled the caramel around it. Let it dry a minute and let it slide off onto a lightly oiled parchment paper lined baking sheet. Make sure the caramel is thick enough to play with. One easy cooling method is to put your pan into a larger one filled with ice as soon as your caramel has taken on the right color on the stove. If it gets too thick, simply reheat on low for a minute. Oh, and have scissors near by in case those caramel strands start taking on a life of their own! To sum up: it was kind of a mixed bag of feelings for me this month. Too much fuss for an okay cake. I can’t talk for the other gals just yet but I suspect that there were as many different experiences and opinion as they were Daring Bakers involved. The techniques employed are not difficult to master even for a novice ( ok-ok- I am the weirdo that thinks that practicing flipping crepe should be a Sunday activity! ), but the batter consistency makes it a pain. Texture wise, I am guessing that unless you use good quality chocolate you won’t taste it much in the final product. Taste wise, it is a shame to say but the filling makes the cake. 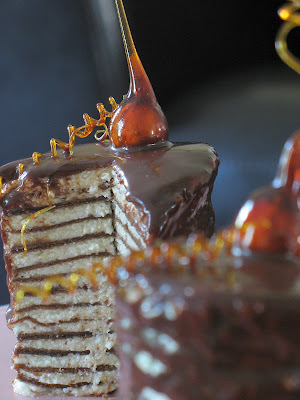 To see what my fellow Daring Bakers have done, check out the drop down menu on the right side of this blog. 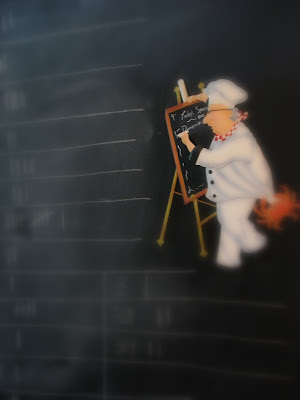 Chef Louis here is keeping track of your votes on my chalkboard pantry door and he is not very busy at the moment. Remember to vote for your favorite mousse to complete this round of HHDD. Voting ends tomorrow at midnight. Drop me an email at marinette1ATcomcastDOTnet with your favorite number!